Los Angeles: The scoreline in San Antonio read 113-100 on Sunday, but the number that really mattered to the Spurs was 21. That's the number that was raised to the rafters as the Spurs -- after downing the New Orleans Pelicans 113-100 -- celebrated the 19-year NBA career of power forward Tim Duncan, who led the team to five championships before retiring prior to this season. "No Tim, no championships," Spurs coach Gregg Popovich said, although that terse summing up was just part of the story told in a playful, sometimes emotional post-game ceremony. Current Spurs players and former Duncan teammates Manu Ginobili and Tony Parker paid tribute to a man they came to know as a friend as well as a teammate. 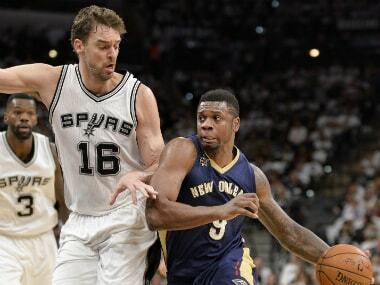 "He didn't lead in the normal way -- there were no chest bumps," Argentina's Ginobili said. "Tim was our leader behind the scenes, in the hotel room or in the locker room out of the public eye." Duncan, 40, departed the league having been named NBA finals Most Valuable Player three times and regular-season MVP twice. The Spurs' .710 winning percentage during Duncan's tenure was the best 19-year stretch in NBA history and was the best in all of the NBA, NFL, NHL and MLB over that time. But Popovich said Duncan's legacy extends beyond the gaudy numbers. 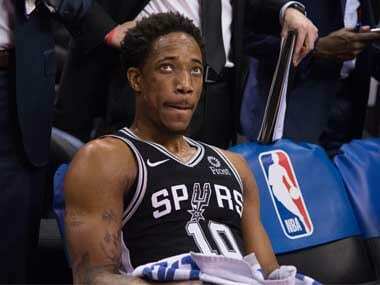 "I am proud to say to his mother and father, who have passed, that he is exactly the man now that he was when he walked in my door," Popovich said. LaMarcus Aldridge scored 22 points and Ginobili added a season-high 17 for the Spurs, who were determined not to let the Pelicans spoil Duncan's night. "We don't want to come in and not win the game for Timmy or not have him be retired on a good night," said guard Danny Green, who contributed nine points in the win. Bradley Beal enjoyed another big night in Washington, scoring 41 points for the Wizards as they rallied for a 117-110 victory over the Los Angeles Clippers. Markieff Morris scored 23 points and John Wall added 18 points and 11 assists for the Wizards, who won their a third straight game for the first time this season. The Wizards overcame an 11-point second-half deficit in the second half and trailed the Clippers 102-95 midway through the fourth quarter. Beal took full advantage of the Clippers' defensive lapses as he notched his second 40-point game of the season. 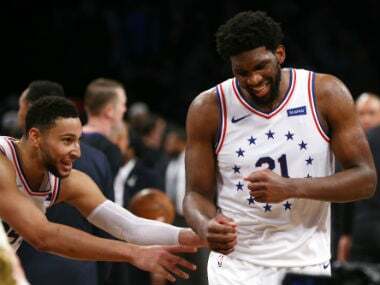 Rookie center Joel Embiid scored a career-high 33 points to lead the Philadelphia 76ers to a 108-107 victory over the Brooklyn Nets. The 76ers snapped an eight-game home losing streak, winning for just the third time in their last 13 games. The Utah Jazz emerged from a tight game in Memphis with an 82-73 victory over the Grizzlies. 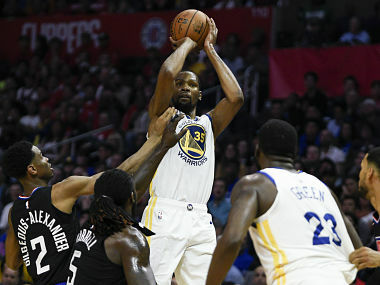 Gordon Heyward scored 22 points and French defensive standout Rudy Gobert added 21 points and 12 rebounds for the Jazz, who handed the Grizzlies a third defeat in four games. 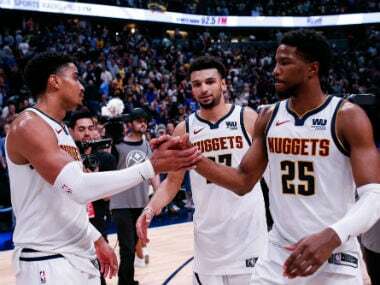 The score was knotted at 66-66 midway through the fourth quarter, but three-pointers by Boris Diaw, Heyward and Shelvyn Mack saw the Jazz pull away. It wasn't close in Orlando, where DeMar DeRozan scored 31 points in just 30 minutes on the floor in the Toronto Raptors' 109-79 rout of the Magic. The Boston Celtics also came up with a big road win, downing the Heat in Miami 105-95. Isaiah Thomas scored 23 points for Boston before he was ejected with 3:02 remaining after his elbow to the right cheek of Justise Winslow left the Miami player with a bloody gash on his face. Although the contact appeared to be inadvertent, Thomas was assessed a flagrant-2 foul and ejected. It didn't change much for the Heat, who lost their second in a row.